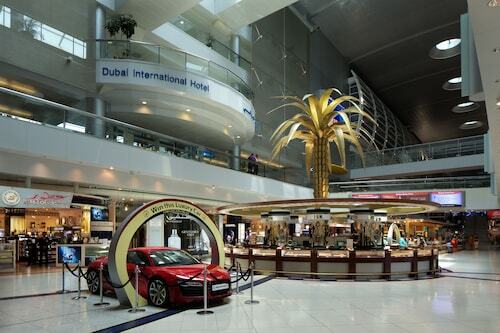 This hotel for passengers in transit only is located inside the Airport Terminal Buildings before Passport Control (Immigration and Customs) in concourses A, B and C. Guests will have access to Dubai duty free shopping areas, post office, currency exchanges, and other facilities available within the airport. Located in Garhoud, this hotel is 1.4 mi (2.2 km) from Dubai Tennis Stadium and 1.9 mi (3.1 km) from Dubai Festival City Mall. City Centre Deira and Dubai Creek are also within 6 mi (10 km). Emirates Station is 14 minutes by foot. Located in the center of Dubai, this family-friendly hotel is within a 10-minute walk of Dubai Festival City Mall and Festival Center. Located in the heart of Dubai, this hotel is 0.5 mi (0.9 km) from Dubai Festival City Mall and within 6 mi (10 km) of Dubai Creek and Gold Souk. Dubai Frame and Bastakiya are also within 9 mi (15 km). Located in the heart of Dubai, this luxury hotel is within a 15-minute walk of Dubai Festival City Mall and Festival Center. 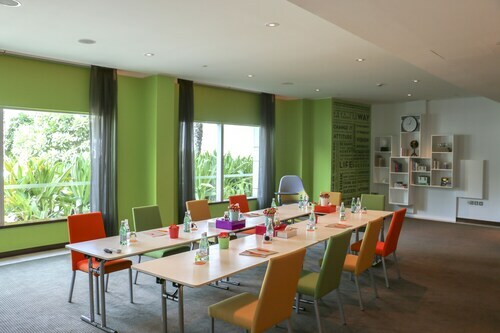 This family-friendly Dubai hotel is located near the airport, within 3 mi (5 km) of Dubai Tennis Stadium and City Centre Deira. Gold Souk and Spice Souk are also within 6 mi (10 km). GGICO Station is 14 minutes by foot. This opulent hotel is located in the heart of Dubai's Culture Village, a 15-minute drive from the Dubai Mall, the world's second largest shopping mall, and 17 minutes from the iconic Burj Khalifa skyscraper. Dubai International Airport is also close by. 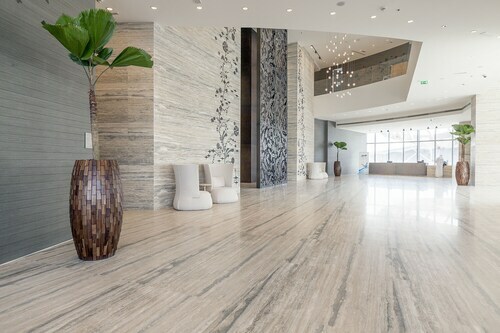 Situated on the waterfront, this apartment building is 1.2 mi (1.9 km) from Dubai Festival City Mall and 2.7 mi (4.4 km) from Dubai Tennis Stadium. City Centre Deira and Dubai Creek are also within 6 mi (10 km). Creek Station is 20 minutes by foot. Located in Garhoud, this hotel is within 3 mi (5 km) of Dubai Tennis Stadium, Dubai Festival City Mall, and City Centre Deira. Dubai Creek and BurJuman Mall are also within 6 mi (10 km). Emirates Station is 8 minutes by foot. 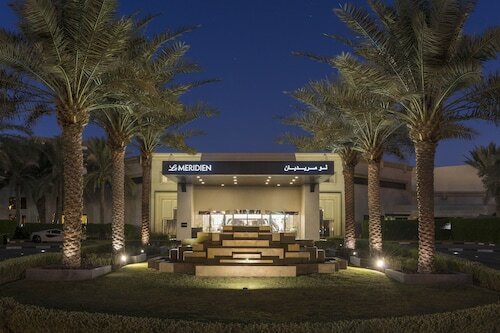 Set amidst 38 acres of landscaped gardens, this modern, low-rise city hotel is two kilometres from Dubai International Airport and the Dubai Creek Golf and Yacht Club. This condo building is located in Dubai (Bur Dubai), close to Dubai Festival City Mall, Dubai Creek, and City Centre Deira. Also nearby are Creek Park and Dubai Tennis Stadium. This apartment building is located in Dubai (Bur Dubai), close to Dubai Festival City Mall, Dubai Creek, and City Centre Deira. Also nearby are Creek Park and Dubai Tennis Stadium. Not everyone will get the opportunity to visit Dubai Festival City Mall. When you arrive there, you'll be happy that you were one of the fortunate ones! 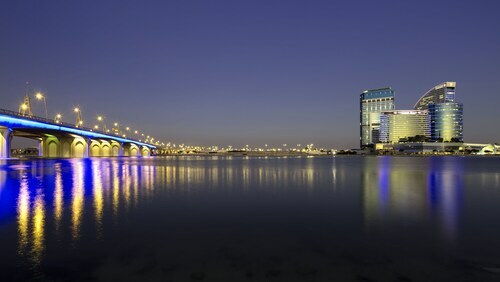 Your adventure will most likely lead through the beloved city of Sharjah. From there, it's 8 miles (13 kilometers) to your destination, Dubai. Of all the ingredients needed for a wonderful break, the significance of a comfortable hotel room should not be underestimated. With 15 accommodations within 2 miles (3 kilometers) of Dubai Festival City Mall, make the effort to find one that's right for you. Only 0.8 miles (1.3 kilometers) away, you will be able to pack it in for the night at the InterContinental Residence Suites Dubai Festival City. A couple of other places are the Park Hyatt Dubai, 2 miles (3 kilometers) away, and the InterContinental Dubai Festival City, 0.3 miles (0.5 kilometers) away. If you're seeking a reasonably priced hotel, have a look at the Palazzo Versace Residences, just 0.8 miles (1.3 kilometers) away. Even the most fearless travelers like a bit of indulgence. Have your turn and spend a night or two at one of the close by first-rate hotels. Two long-time favorites are the Crowne Plaza Festival City, 0.3 miles (0.5 kilometers) away, and the Palazzo Versace Dubai, only 0.8 miles (1.3 kilometers) away. There is nothing like wandering around a new place to build up an appetite. After going to Dubai Festival City Mall, boost your energy levels just a short walk away, at Godiva Festival City. If you'd rather have fare that's more fulfilling, Hardee's is just a shout away. It's the right time to round up your friends for a nightcap when the shadows grow longer. Ask the bartender for your favorite beer, wine or spirit at Hard Rock Cafe, also a short walk away. If you'd like a keepsake of your vacation, go beyond the everyday T-shirts, fridge magnets and mugs, and get the perfect memento at Festival Center. Al Badia Golf Club is a good place to play a few rounds and socialize. Hoping to find a green space to enjoy a family picnic, a relaxing walk or just sit in the sun? Head over to Creekside Park. Enjoy a round or two, get some exercise and mentally challenge yourself at Dubai Creek Golf & Yacht Club. Children’s City has numerous hands-on exhibits for inquisitive learners. The youngsters will be occupied for eons! How Much is a Hotel Room in Dubai Festival City Mall? Hotels in Dubai Festival City Mall start at $31 per night. Prices and availability subject to change. Additional terms may apply.